Stores that celebrities’ dreams are made of. What if an entrepreneur opened a chain of whimsical candy stores, each demanding attention in high-profile shopping locations across the country? Dylan’s fits perfectly into the Magnificent Mile (Chicago) and Union Square (NY) retail landscapes. Its fabulous lollipop tree, nostalgia shop, fudge counter, café, bar, and party room satisfy the sweet-tooth of every candy lover. 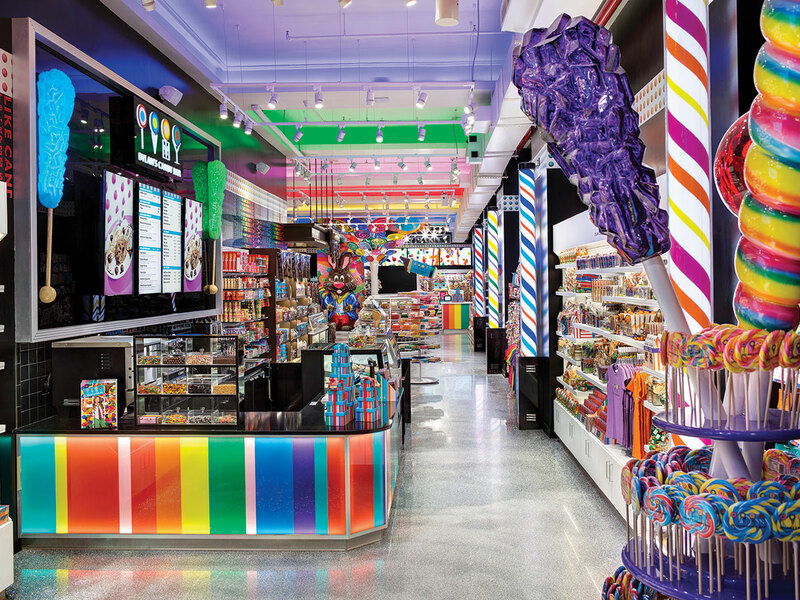 Dylan’s Candy Bars feature larger-than-life design elements, including a two-story lollipop sculpture at the center of each store, a massive chocolate bunny rabbit, thousands of pounds of bulk candy available for purchase, and a gigantic, dripping fudge sculpture. Nothing is too crazy or outlandish for this space. Our team designed branded graphics throughout the space, which contain displays to attract both youth and adult customers and used enhanced ceiling lighting to represent the Dylan’s highly recognized brand stripe pattern. We designed a flexible space to showcase all things candy, and additional products that include apparel, jewelry, and plush toys that entice customers and can easily be changed based on needs of the store assortment. These dynamic spaces feature more to do than just buy delicious candy. Customers can grab a seat at an actual bar and café or have goodies personalized and professionally packaged. Dylan’s Candy Bar is also the hottest place in town to host birthday parties. Guests can enjoy an over-the-top rentable room for their next event.